You gotta go where the money is, right? Six people in China have been arrested for smuggling nylon bags stuffed with iPhone 4s and iPad 2s across the Sha Tau Kok River. Normally this sort of operation would be carried out in the dead of night with a small boat. But this is the 21st century and iDevices make big money! 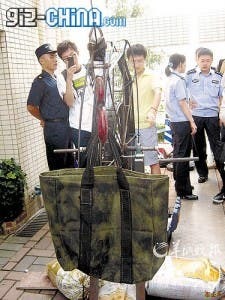 These inventive money makers tied one end of a heavy fishing line to the 21st floor of Shenzhen high-rise and used a crossbow to fire the other end 1,000 feet across the river to a small house. A pulley was then used to ferry the iThings through the sky Hong Kong where a profit could be made. I, for one, cannot wait to hear how they escape from incarceration!